Retail in Sight: Why Consider Solar Energy Buildings? At Regency, we are extremely proud of our sustainability efforts. Whether it is our Green Bond issuance, solar panel initiatives, or achieving our ten-year sustainability goals in five, we are constantly committed to bettering our environment and increasing value across the board. The reasons to support these efforts are clear to us, but others may have their doubts. Evidence of solar power gaining popularity can be seen by the glass-paneled rooftops of thousands of homes across America. The concept driving this trend in residential is simple: solar energy costs less than electric. The commercial real estate industry has been gradually tapping into the benefits of solar power, and even retailers like Best Buy and Trader Joe’s are seeing the light. 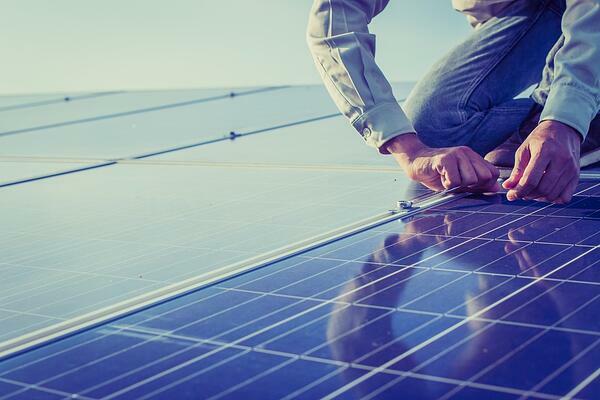 As the New York Times reported in 2012, large chain stores like Walmart, Kohls, Walgreens, and Ikea have been leading the way in solar power use, which more than any other type of business, rely on rooftop solar power to help meet their energy needs. How can solar energy benefit retailers? For the most part, the main advantage of solar energy in commercial properties is the same as for residential properties — cost savings. However, due to the size of many commercial buildings, the reductions in energy cost can be exponentially greater and can be realized in a shorter amount of time. As Clean Energy Experts explains, commercial buildings typically can handle a larger solar system size, and benefit from a lower per kilowatt-installed rate. Furthermore, businesses tend to stay in one building for a longer period of time than homeowners, realizing a more complete economic benefit of solar power. Reduction in cost remains the greatest motivating factor, and evidence from solar-powered stores over the last seven years suggests other retailers considering the change. Facility Executive reports that from 2010 to 2016, the cost of electricity decreased from 27 cents to seven cents, thus increasing the financial appeal of solar energy. During this same period, retailers began to enjoy remarkable bottom-line benefits of harnessing the power of the sun. In addition, Facility Executive reports that Best Buy had energy cost savings of 25% over the course of four years at its franchise in Richfield, MN, and Trader Joe’s, in a 2011 partnership with Regency Centers, offset approximately 65% of its total electricity use with solar power. The World Green Building Council (WGBC) reported in 2016 that greener buildings often equal happier customers, and therefore greater revenues. While the commercial real estate industry may not be ready to embrace these early findings, a case for solar energy is likely to continue motivating retailers across the world to improve their financial standing by installing solar systems in their buildings. If you would like more information about Regency’s own sustainability program and it’s continuing value, then we would encourage you to visit our website at www.regencycenters.com/regency/sustainability.